You may think travel season is basically over, but I beg to differ. September is actually a perfect time to make an escape. The crowds have dwindled, the temperatures have cooled. In Europe, most locals are back from their vacations which means more authentic rather than tourist soaked cultural flavor. Plus, who doesn’t want to extend summer just a touch longer. Especially it it means that you could go stay in this gorgeous Italian home for a week! But back to this gorgeous house. The architecture alone – limestone floors and cathedral ceilings are a wow factor. It’s been opened up with french doors and transoms to offer gorgeous natural light and views of the stunning surroundings. The furnishings on the other hand are understated and sparse. Mid-century classics are paired with antiques and flea market finds to offer simple comfort that doesn’t detract from the dramatic spaces. The bedrooms continue the rustic charm, but offer romantic touches including canopy beds. Yes, I’ll take my wine on the terrace please. This bathroom reminds me of one of our most popular shoots of all time. If you want to truly get away from it all, it feels like Masseria Angiulli Piccolo would be the perfect spot. And I certainly wouldn’t mind taking a couple of style cues from the interior design for our own house. Move over Amalfi coast. There’s a new Italian hot spot in town. 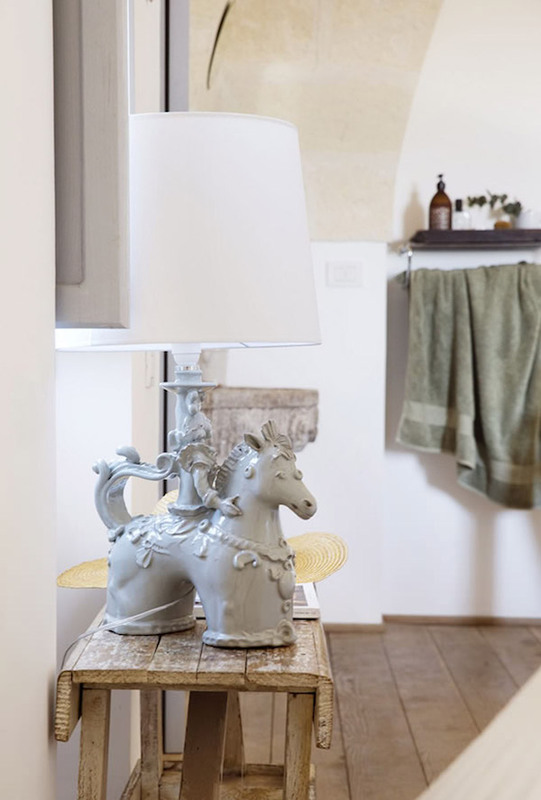 You can get all the details about how to rent this Masseria right here. Hoe do I rent that house?